Typically we celebrate this rite of passage here at OLM in the second grade, and so our Catholic Faith Formation in that grade is geared towards this goal. 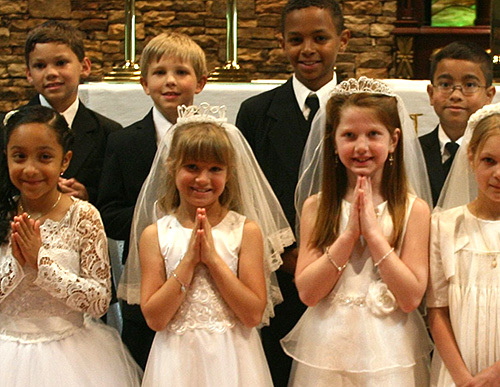 For a Catholic family, First Holy Communion is a wonderful moment in their lives; for each generation remembers with joy something of their first Holy Communion, and sees before them the future in this second grader, who is now even more fully integrated into the worshiping Church. We love the Lord, and we would not dream of being out of Communion with Him or with his Church. This is, thus, an essential rite of passage for any Catholic. Preparing for First Penance and First Holy Communion begins with the first class of the year and continues until the day of First Communion. Parents are required to attend a First Penance class with their child as preparation for this sacrament. The family is also asked to meet with the other families preparing for First Communion for an afternoon of instruction and fellowship and the sharing of a meal. This Parent and Child Meeting is an important step in preparation for First Communion. It’s an enjoyable family get-together and takes place outside of class time. Part of First Communion preparation is learning about the Mass and working toward a deeper understanding of the Miracle that takes place at every Mass when bread and wine become our Lord’s Body, Blood, Soul, and Divinity. Attending Mass every Sunday or Saturday Vigil is a must. Please be mindful of meeting the preparatory classes so that your son or daughter is ready for this important step in their spiritual life. Also, essential is your at-home preparation, so that you discuss this great mystery of the Eucharist, and how it is important (indeed the most important thing) in our Catholic life. When we are in Communion with the Lord, then we are on the way to holiness, and that ultimate Communion with Christ in eternity.